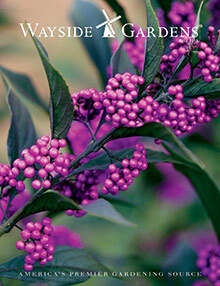 Wayside Gardens catalog helps you plant your garden with unique perennials, roses and unusual plants and with savings using the coupon code at the expert gardeners favorite online plant nursery. Enter coupon code - FABWG - at checkout on the Wayside Gardens website. Unique Perennials, Roses and Bulbs - Perennials are the heart of your garden, returning year after year to lend their color and texture to your flower beds. Find sun loving perennials, shade tolerant varieties and ferns, ornamental grasses and easy to grow ground covers that mix with premium roses and vibrant caladium, canna and dahlia bulbs to create a gardener's paradise. With the Wayside Gardens coupon, you will feel less guilt choosing multiple top quality roses, with climbing roses, hybrid teas and floribundas for your patio containers and hedge plantings. Low maintenance Shrubs and Trees - Wayside Gardens is the best online plant nursery for flowering shrubs and evergreen hedges to establish the anchor plantings for your landscape. You will be rewarded for years by the eye catching, easy to care for hydrangeas, rhododendron and hibiscus. They have expert garden recommendations for butterfly attracting shrubs and cold hardy trees, fruit trees and vigorous specimens that are shipped from their online garden nursery with well established root systems. Flowering Vines and Climbers - Premium vines and flowering climbers can be the perfect plants to add dimension and fragrance to your garden. Wayside Gardens carries climbing plants like clematis, honeysuckle, shrub rose, and wisteria to accent your pergola, fence or decorative garden structures. The horticulture experts at Wayside Gardens also offer pruning guides and planting advice to ensure that your garden plants flourish and perform to your exacting expectations. Garden Enthusiast Supplies - Use the Wayside Gardens coupon to add to your collection of expert garden tools to turn your cultivating tasks into pleasures. You will find premium hand tools, raised garden beds, plant supports, stylish garden structures and garden enhancing outdoor lighting. They also carry top quality nutrients, soil enhancers and premium fertilizers to ensure healthy plants and maximum growth. Wayside Gardens is the perfect online nursery to find unique and thoughtful gardening gifts for passionate gardeners. Founded in 1920 by two European horticulturalists, Wayside Gardens has grown into the leader in outstanding and unusual varieties, excellent plant quality and professional service for the discerning gardener. Serious gardening enthusiasts will return season after season for superior quality and impeccable customer service from this exceptional online garden nursery.